So, what is retargeting? And why do so many digital marketers recommend it? Imagine this scenario – you’ve worked hard on your website. You’ve spent money on ads and you’re getting lots of traffic to your website. A customer on your site clicked on an item and added it to their cart. Suddenly, the doorbell rings and they answer it before they could check-out. When they return, they’ve forgotten all about the item and moved on to browsing other sites. This is where retargeting comes in. Retargeting is a marketing strategy where you send ads to people who have landed on your website, but did not complete the action you wanted them to take. It could have been someone who added an item to a cart but did not check out. Or someone who landed on your blog post but did not download your e-book. Or very simply someone who has landed on your website once before. Retargeting allows you to target your most high-value leads and constantly remind them about your brand through ads. What is the difference between retargeting and remarketing? There is a subtle difference between retargeting and remarketing. The main difference lies in the method used to remind your customers about your brand’s existence. While retargeting utilizes ads, remarketing primarily focuses on emails as the marketing medium. When you add a pair of shoes to your shopping cart, and you suddenly see the same shoe popping up on every other website you visit, that is retargeting in action. When you start receiving emails showing you the shoes you were eyeing, as well as other promotional offers from the same store, that is classified under remarketing. How do you use retargeting? The first step, as with any strategy, is to plan your retargeting strategy. You can use a retargeting funnel to help visualize this. 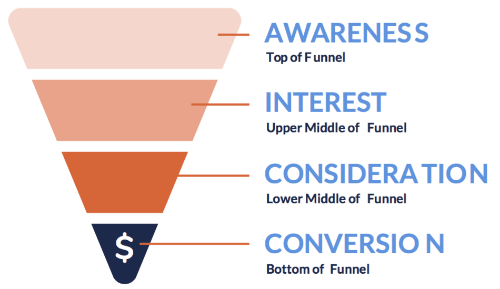 At the top of the funnel, you want people to start becoming aware of your brand. You would prospect for new customers at this stage using ‘interest targeting’ and show them introductory ads such as a video explaining what your business is about. In the middle of the funnel are the people who are already aware of your brand’s existence and have visited your website at least once before. You want to start convincing these people to take interest and consider purchasing from your brand. One way to keep them interested is by always staying at the top of their minds. People in the middle of the funnel have usually visited your website before and didn’t make a purchase as they had other factors to consider. At this stage, you can utilize retargeting to continue showing ads to your audience, reminding them that you’ve got even more up your sleeve than they may have realized when they first visited your website. Finally, at the bottom of the funnel, you want to convert people after they’ve shown a lot of interest in your brand. They may have downloaded some marketing brochures from your website, or visited a specific page such as your pricing page. You can once again employ retargeting to send an irresistible offer to this group of people. But how exactly do you set things up to enable retargeting? Let’s focus on retargeting website visitors through Facebook ads. There are two main elements involved in this process – a tracking pixel (or Facebook pixel), and custom audiences. Pixels are used to identify who your visitors are. Think of pixels as a tracker placed on every individual that visits your website. 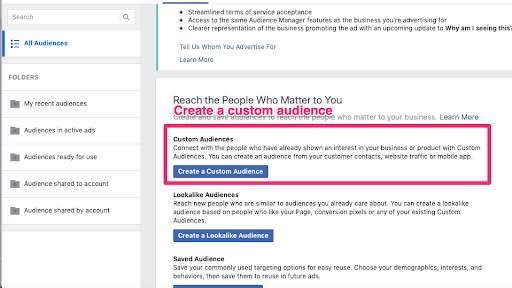 Custom audiences are target groups that you specially create, separate from the wide range of interest groups already offered as targeting options on Facebook. This is the account where you will create and manage all your Facebook ads. 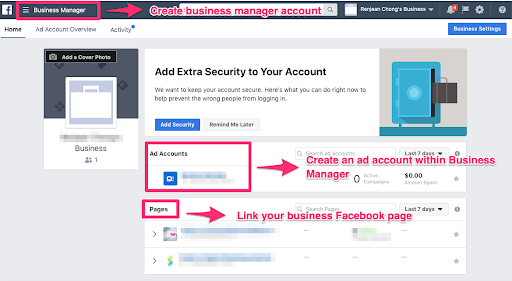 You will need to connect your Facebook page to your business manager account, as well as set up an ad account to enable payments. Once you’ve created your business manager account and ad account, you need to create a pixel that will link your ad account to your website. Go to your ad account, select Pixel, and create a new pixel. 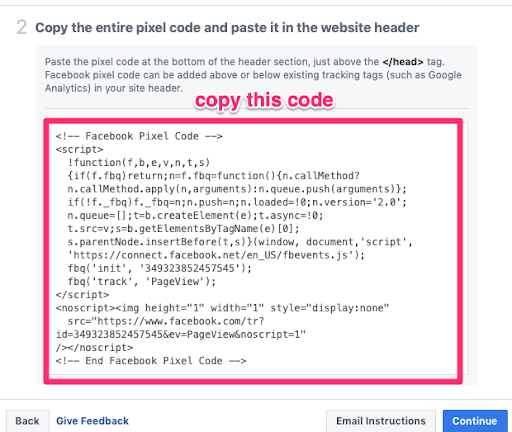 Facebook will give you a pixel code to be inserted into your website. After clicking ‘Create a new pixel’, you will be prompted through a series of steps to generate your pixel code. Depending on the website host you use, you can easily insert the pixel code into your website through copy-paste. If you use WordPress, download the plug-in “Insert Headers and Footers”, and paste the code into the header. It should look something like this. 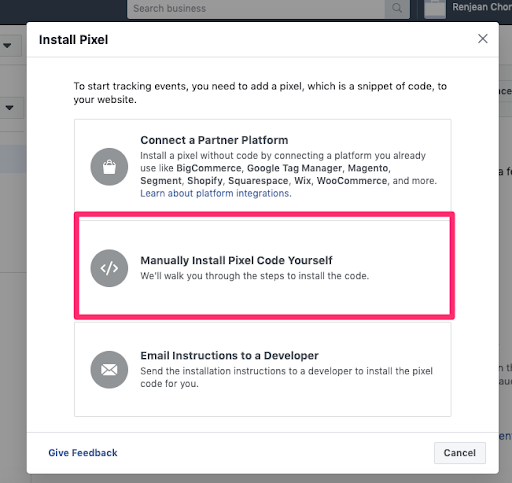 Once your code is inserted, Facebook will be able to put a ‘tracker’ on every person who visits your website. With this tracker, Facebook will be able to identify who visited your website in the last 30 days, who landed on a specific page, etc. You can then create a custom audience based on these parameters. 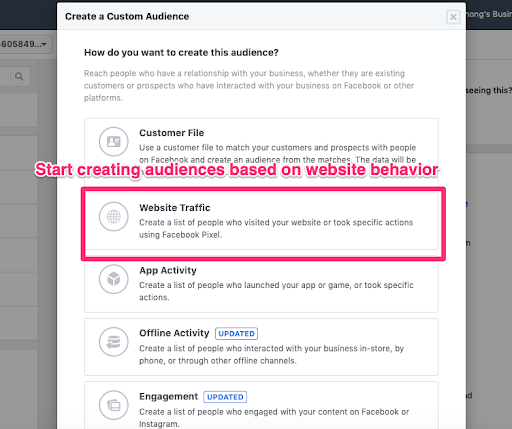 With your Facebook pixel installed and your custom audiences created, you can now successfully run your retargeting campaign and show highly targeted ads to your website visitors. Phew, that was a lot of information to digest! So, by now you know what is retargeting, and why you need it. But the question on everyone’s mind is — does retargeting really work? When used effectively with the right planning and strategy, retargeting can increase your conversion rate by up to 70%. 91% of marketers have also found retargeting to be a high performing channel to reach their marketing goals. So, the question on everyone’s mind instead should be — will you be one of the 91% who reports success? At Them You & Me, we help you grow your business through digital marketing strategies. We demystify and help you approach digital marketing for your company with confidence. Contact us if you have any questions about retargeting and how you can use it in your digital marketing strategy.